A special entry by Jeremy Fong. Time. As children, we are taught how to tell the passage of time through a clock. The passing of each big hand, a minute, and the small hand, an hour. But as an adult I’m starting to realize how little I truly understand about time. A minute is made up of sixty seconds. 1, 2, 3…60. Yet there are moments when each second is an eternity, and time refuses to flow. And there are other times when each second is so fleeting, time seems to flow right through me. What is time, and what makes it valuable? Only a few days ago, the narrative of this newsletter would have been completely different. On December 21, my mother and I were involved in a solo car crash. As we approached the freeway from the onramp, we lost control of the car. Perhaps it was the worn out tires, the freshly wet road, or driver miscalculation, it didn’t matter. All I could think about at the time was, ‘Well this is it. This is how I die’. We bounced off the meter high wall dividing us from the thirty feet drop from the overpass, and spun around until colliding with the other side of the lane’s wall putting us facing towards oncoming traffic. It was one of the most terrifying moments of my life. The danger was immediate and threatening, and my life was not the only one at stake. Once the car had stopped, my eyes quickly shifted to my mom. Was she injured? Could I help her even if she was? We both looked at each other, examining one another for injuries. But we were both unharmed. The rest is mostly a blur. I made sure to hold my mom’s hand while going through the conversations with first respondents, family members, and inevitably insurance companies. I’m not sure if I thought I was doing it to prove I was strong to my mom or the other way around. All I could do at the time was focus on force I could feel on my fingers as I tried to ground my body once again. Whether I was actually going to or not, as we approached the first wall, I thought I was going to die. And now I’m not going to take my life for granted again. My life could have ended right then. Time slipped right through my fingers, as my mind struggle to keep up. It happened all within a matter of seconds. Yet even days later, I have still yet to process such a tiny percentage of my life. Of course, being the person I am, my most pressing thoughts have nothing to do with the actual event, but the philosophical implications of it. The majority of those thoughts stemmed from the idea of human frailty. Even if I was unaware, I felt entitled to this life, a future that God had planned out for me. I thought of all the things that I would accomplish, of this life I envisioned for myself. It could have been taken from me, except for the fact that it doesn’t exist. I’m not guaranteed anything in this life. I can have all these elaborate plans for my future, but I am only kidding myself if I think I can discern the plans God has for me. Albeit, this is the lesson that God has definitely placed on my heart while on this gap year, and what I can only hope, cemented, through the car crash. Christmas marks five and a half months since arriving back. That’s a total of 240,480 minutes and 14,428,800 seconds and counting. I will be the first to admit that I hated the idea of spending a gap year living in the States. I was not in a good place with myself, and most definitely not with God. At the end of Senior year, I had tried build my life back together on my own. But it had come crashing down. I was hurting, but I was determined not to let it happen again. I needed to find God, and find Him I did. Honestly, at this point I can’t even remember all the times I’ve seen God working in my life. Whether it be through simple conversations, cultivated relationships, or opportunities that have suddenly presented themselves, I’ve truly been blessed each day here. I distinctly remember a conversation with someone from church that has stuck with me all this time. I don’t recall the exact wording, but she said something along these lines, “Jeremy, you’re in a season of receiving. I know that may be a hard thing to accept because you have given so much to others. But God has placed you in this season for a reason…”. That was during my first month back, and looking from the mountains I have overcome, she was so right. There are some days that I wish didn’t happen while I was here. But they pale in comparison to all the joy that has entered my life. I will always remember my time in California fondly. There’s just so much to be grateful for. I’m speechless just trying to process it all. I know I’ve grown so much here and I’m thankful for each and everyone who have helped me along the way. In a matter of months, I’ve learned a lifetime of lessons. I’ve learned to distinguish the difference between giving up and letting go, to allow my narrative to be ever-changing, to not undermine my self-worth, and ultimately to allow God to be the center of my life. He saved my mom and I in that accident. How else can I explain any of it? I still don’t understand why exactly it happened. What was the point of allowing us to get into an accident, only to remain unscathed? But to think of other possible outcomes or circumstances makes me sick. I am here writing, breathing and unharmed, and all I can be is grateful. Those few seconds in the car were so fleeting, but I now have a lifetime to reflect. And from this moment, I know that my time is valuable. I can only hope that I continue to use it wisely. If I wrote this post just four days ago, it would be about the joy and challenges of welcoming a new furry member into our family. We adopted Aoba from a dog rescue organization on September 16th, just before she turned 3 months old. Having a puppy in the house has been a challenge, but mostly it has been the joy of having a pet who loves you even more than you love them. But three nights ago, the narrative of this post changed in a way that fills me with sorrow. Chiizu, one of the feral cats living in our neighborhood, was struck and killed. Chiizu was no ordinary feral cat to us. He adopted us as his family, basking in the sun on our doorstep, greeting us in the morning and evening for his meals, eating from our hands. I was convinced it was a matter of weeks before I would have enough of his trust that he would allow me to finally pet him, giving him the physical love that he deserved. You see, Chiizu was the largest boy in his litter of kittens. Their father was never around and their mother disappeared mysteriously four months ago. Chiizu, for whatever reason, became the caretaker of his siblings. We would often find him cuddled up with one of his sisters, or his little brother Pika, napping around our house. If he was eating and one of his siblings came near, he’d move away and let them eat. While many of the other cats visited our house regularly, it was always “Chiizu and …”. So for six months I regarded him as ours, the same way he regarded us as his. One of the reasons I resisted pet ownership for so long after our dog Evie passed in 2012 at 14-years-old was because I did not like to deal with the mortality issue of pets. Every time I’ve lost a pet to the inevitable passage of time, I swore I’d never have another. But this is the first time I’ve had to deal with the loss of a pet whose life was cut short. The loss of Chiizu is still fresh, grating on my emotions, and causing me to give pause during the day to think about the hole his absence leaves in my daily life. But that loss is balanced by the time we spend with Aoba, so young and full of life herself, ready to lick me to death or snuggle up when she’s tired at the end of a long day of playing and exploring. And I feel like God is teaching me about mortality, about not holding on too tightly to things, even life itself. That the cliche that everyday is a gift is cliche because it is true. Aoba won’t live forever and neither will I (at least in this space and time). But God gives us each day richly to enjoy and if we focus on the good gifts He gives us, life is a lot easier to bear. One might even say, life is beautiful when enjoyed the way God intended us to. Thank you Lord for each of the days we had to enjoy with Chiizu and each special day we have to love and be loved by Aoba. Most people are used to dealing with distractions and minor inconveniences in life, so much so that we often don’t even take notice of them. We call them “the small stuff”, and while we may become a little irritated for a moment, we roll on, doing what needs to be done. But because “the small stuff” can be so minor, we may not notice it until it begins to pile on. You rarely notice the dust in your house until you move the filing cabinet and find that huge filthy pile of it on the floor underneath. And in this same way, the enemy finds ways to get to us. Oh it starts off innocuously enough. Maybe a few days of rain that force you to change your plans with friends. Perhaps a little ache in your back from sitting too long at the computer. But the rain continues, nearly an entire month. Things people do that you would have easily ignored become major issues. Social media becomes a mental and emotional drain as you are bombarded with negative thoughts and articles. The suffering of people around you becomes magnified as you start to think about your own life. The enemy is now inside your head. Once he gets into your head, he can start telling you things that you have difficulty distinguishing from your own thoughts: “You’re getting old and you’re falling apart.” “The whole world is a mess and there’s nothing you can do about it.” “You aren’t a good parent/child/spouse.” And you believe these things because they are coming from inside yourself. So you turn inside and reduce your interactions with people and wallow in your own self pity. That’s the kind of month September has been for me. Distraction upon distraction, but none large enough to fall upon my knees and cry out to the Lord for rescue. Only in retrospect do I realize how cunning the enemy is in keeping me from prayer. These are just little things; why do I need God’s help? Yet these little things are slowly eating away at my peace, my joy and my enthusiasm for the work I am doing. Today, I finally fully recognized the tactics of the enemy. I have been played. September is a month I can never get back, but I can repent of my lack of faith, my lack of prayer and rush back to the arms of our Heavenly Father. On my hands and knees I can find my place again, at the feet of Jesus, hearing his soothing words which restore my peace and reassure me of my relationships as a father, brother, son, and most importantly child of God. It’s difficult to write about the ways you have failed, but I feel like we’ve all been there, following the general path the Lord has put us on but needlessly straying to the left and right, influenced by our emotions and not able to keep our bearings due to lack of prayer. That kind of journey is fraught with restlessness and worry instead of the peace that can be found in the love of Christ. Tomorrow is a new day, a new month, and God’s promises are new every morning. His faithfulness is constant even when ours is not. Blessed be the name of the Lord. Recently, my pastor participated in a neighborhood festival and was given the honor of helping to carry the mikoshi. Once you have read and digested that sentence, you will likely fall into one of three groups of people. The first group thinks: “That’s nice that the pastor of your church is an active and respected member of the community.” and nothing more. So which of these three groups of people’s beliefs are correct? The answer is more complicated than you probably think. Before we dive into this question, I want to say that I am well aware of the fact that this is a controversial subject. I may state things in a way you might find offensive, and though I intend no offense, I do not automatically apologize for it either. Perhaps it is you that needs to reconsider your views of Christianity, missions and evangelism and perhaps that truth can range from irritating to painful. If you are not ready to confront your own potential blind spots in these areas, it is best for you to stop reading here. Here we have a conundrum. Two of the three possible responses to this situation are in direct opposition to one another, and it would not be surprising for well-intentioned Christians to line up on either side of the issue, ready to defend it with strong words for the other side. And that’s where we’d all be wrong. The answer to the question, in my opinion, is that all three groups are correct and none of the three are correct, and it depends on the situation and the prayerful discernment of the one who must make that choice. That answer is probably completely unsatisfactory to many of you. But perhaps that is because we as modern Christians have grown lazy in our spirituality. We expect the Bible to spit out an answer in form of chapter and verse that unequivocally answers our questions of morality. Unlike the spiritual giants of the past who spent hours a day locked in a room pleading for God to speak, we believe the Lord will give us an answer to our deepest questions in a 15 minute quiet time over coffee and a piece of toast. And we fail to remember that the Bible wasn’t written in chapter and verses, neatly divided up for us to cherry-pick our answers from. The Bible is to be taken as a whole to see the character of God through His relationship with His people and that of His Son, Jesus Christ. In high school government, we learned the difference between the letter of the law and the spirit of the law. When you divide the Bible into verses and take them out of context, it is far too easy to find the letter of the Law without discerning the Spirit, in this case, the Holy Spirit, who will reveal the character and nature of God through the entire text. So in that context, the Bible does not speak directly to the participation in a Japanese festival, nor should we expect it to. It does speak about worshiping false gods. It also speaks about how Jesus himself broke perceived religious rules to reach people where they were at. When we cherry-pick from either of these verses, we end up in opposition with our own brethren, sometimes to the point of contention. Much is left out of the sentence that began this division of Christian opinions. One of the major points is the fact that prior to starting relationship building with community leaders, our church was viewed with suspicion and perhaps even enmity in the community. Certainly, there was a lack of trust in the goodwill of the church toward the people in the neighborhood. After many years of actively participating in the community including attending community meetings and events and rising to a leadership role, our pastor was given the honor of carrying the mikoshi in the annual festival. Now, let’s put ourselves in his shoes for a moment. After investing years of relationship building and trust creation with the leaders of the community, you are offered one of the highest honors they can bestow on you. To these people, they view carrying the mikoshi as nothing more than a symbol of being a leader in the community; there are no religious overtones tying it to Shintoism. But you are aware that some members of your church and the Christian community in general will not see it that way. What do you choose to do? Do you turn down the honor, which sends a message to the people that while we say you don’t have to be a Christian to come to church, if you are a Christian you can’t be a part of community events based on Japanese cultural traditions? Such a response can easily snowball into the misconception that you are a hypocrite, that what is good enough for the “pagans” is not good enough for Christians. Or do you accept the honor, incurring the wrath and judgment (much of it in silence, behind your back) of the Christian community who sees your actions as heretical? Do you accept the possibility that some of your own congregation may leave your church because they so sharply disagree with your actions? As you can see, there is no easy answer. Even if you believe accepting the honor from the community is the right choice, you will have to deal with the consequences. And in fact, there may be cases where choosing not to participate in such a festival is the correct decision. But one cannot discern either decision without wrestling with the answer in prayer and meditation. Let me end this with one more analogy. For those of us in full-time ministry, we are fighting a spiritual battle against our enemy, the devil and his demons, for the souls of the lost. This is the front lines and though the battle belongs to the Lord, the enemy is using every trick, every tactic to hold us back. One of the greatest tactics he will use against us is to turn us on ourselves. In the stress of the battlefield, it is actually quite easy for him to do this to us. If we’re too busy killing off each other, we have no time to give life to those who need it. So pulling back the camera and looking at the big picture, are the decisions being made by people furthering or hindering the communication of the gospel to the people who most need to hear it? And if we’re not willing to support one another in decisions that we don’t agree with, can we at least agree not to tear each other down for those decisions when they are made for the sake of the gospel? Let us not become our own greatest enemy, standing between our brothers and those hungry for the gospel. “Baby diapers.” That’s how my traveling companion Yuji described the smell, as we approached the site. Once you get that image in your mind it’s hard to shake it. But indeed, the smell of coffee cherries going through the process of having their husks removed and the beans washed does have strong olfactory similarities to what goes on in a toddler’s diaper 35 minutes after eating lunch. The smell of “baby diapers” or coffee processing is noticeable in many parts of the village of Doi Chang, high in the mountains above Chiang Rai in northern Thailand. Doi Chang is an Akha village, a hilltribe living largely in Thailand, but also in neighboring Myanmar, Laos, and even southwest China. They are not Thai; they have their own language, their own culture, and for the most part, the Thai government won’t even grant most of them citizenship. They are stateless in the country they live in, and as such, are one of the poorest people groups in Asia, the average Akha living on less than $2.00 US per day. But let’s say you come from one of the dozens of neighboring Akha villages to Doi Chang. To you, this modest little village of a few thousand people could look like New York City. Most of the roads are paved and well maintained. There is a school for children up to Jr. high school and a preschool for children younger than that. Nearly every family drives around in an expensive Toyota 4-wheel-drive truck. So what’s the difference here? The difference, to put it simply, is coffee. Decades ago, this area of the world was known as the Golden Triangle, the meeting point of Thailand, Laos and Myanmar. The fertile lands of this region were productive for growing crops and the crop of choice in those days was the opium poppy. The drug trade took a terrible toll on both the countries involved and the hilltribes who were willing and unwilling participants. So the government of Thailand decided to give the hilltribes an alternative and funded a plan to give them a new crop to grow: coffee trees. Today, Thailand ranks 18th in the world in coffee production and coffee grown in the “Doi Chaang” region (note the extra ‘a’), is designated with a geographically protected trademark for its high level of quality. The farmers of Doi Chang village are the primary producers of Doi Chaang regional coffee. Around the village, there are several smaller processing plants and one large one belonging to the major distributor known as “Doi Chaang Coffee” Company. When you’re the biggest, you get to own the name. Nearly every family in the village is growing, harvesting or processing coffee, most involved in multiple aspects. But only a few are running companies that are able to distribute the finished products: either raw beans ready to be roasted or roasted beans ready to be sold to retailers or consumers. Our friend Pat is one of the few. His company, Abonzo Coffee, named after his grandfather who helped convince then reluctant Akha villagers to adopt coffee trees over opium poppies, is small by global standards. Even next to local competitor Doi Chaang Coffee, his production is a small fraction of theirs. He grows coffee on family owned land and purchases the rest from 25 local farmers who chose to sell to him. But while other coffee companies primarily exist to make money, Abonzo exists to help raise the Akha people out of their cycle of poverty. Pat dreams of expanding his business into overseas markets, adding more farmers to his production and building a brand that is as respected for its devotion to social justice as it is to the quality of the coffee it produces. The cycle of poverty among the Akha, as it is among many impoverished people groups, is bonded with the lack of access to higher education. Doi Chang has a public school providing education up to Junior high school level, but getting an education beyond that means a long daily commute down to the city and paying a tuition that most poor farmers cannot afford. Akha who are particularly well off send their children to live in dormitories in the city so they can go to school daily, but most can’t afford such “luxury”. But Pat doesn’t want the education of his people to be a luxury, but a necessity. He even aims to teach young Akha people business skills by providing them work and training in the coffee business beyond cherry picking and processing. He intends to build a cafe that will employ many young Akha and next to that, a barista training school that will give them means to learn a skill that is transferable to other jobs (Chiang Rai is the de facto coffee capital of Thailand and cafes are springing up all over the city). The purpose of our trip to Doi Chang was to photograph the coffee production process of Abonzo Coffee along with a friend we brought from Tokyo who is working with several high-end cafes to potentially use Abonzo Coffee as their house brand here in Japan. As the Doi Chaang regional brand becomes more widely known, unscrupulous growers have been claiming to sell “Doi Chaang” regional beans when their beans are of inferior quality grown elsewhere. Our intent was to show Abonzo Coffee is a true Doi Chang village coffee company and that the beans Pat uses are authentically grown in the region. We also hand carried samples back to Japan to share with potential new customers. So how does all of this tie back to missions? Interestingly enough, when I joined World Christian Fellowship as their Executive Director many years ago, I attended a prayer meeting where one of the participants mentioned the Akha people. They told the story of the Akha people’s plight of poverty, exploitation, and abuse by the countries they have settled in. In that moment, God laid a burden for the Akha on my heart. Though the Lord brought us to Japan to serve the Japanese, at the same time, He created a path for me to serve the Akha people through Pat and Abonzo Coffee, as well as our missionary friends serving in Northern Thailand. It’s amazing how the Lord opens doors for us to serve, and much of what He does goes on beyond what we can see or comprehend. Join me in lifting up the plight of the Akha people and for young Akha leaders like Pat who desire both spiritual and socio-economic revival for their tribe. Heavenly Father, you know the names and struggles of each of your Akha children, and you desire to give them a life of abundance and not mere survival. Hear every cry and answer them, Lord God, and use others outside the tribe to have compassion and generosity toward them in the love of Christ Jesus. For you work righteousness and justice for all who are oppressed; You show compassion and mercy to all those who love you. Let your will be done among your people, the Akha. Amen. Tomorrow marks 19 months to the day that we arrived in Japan with stars in our eyes, giddy with expectation. Tomorrow is Tuesday, and it will feel like just a normal Tuesday with school and work, a trip to the supermarket and some language study time. Many of the things that fascinated me about Japanese life are no longer quite so fascinating. We are grateful to be able to walk a couple hundred meters (yes, meters, not yards) down the road to pick up some fresh produce from a roadside stand and leave money in a lockbox, but it’s no longer a novelty. I no longer think the world is ending when driving down two way streets that are the width of 1.35 cars and I see another car coming toward me. These are all just part of our life now, the life we have here in suburban Tokyo. I can’t say for sure when I personally crossed the point where I stopped thinking of myself as a missionary and began to regard our current situation as a season of our lives. But with that shift came some changes in mentality, some good, some bad, some just gray. For those who desire an insight into the mind of a 1.5 year learner in the field, here’s what I have come to understand so far. Ministry life integrates into the world we live in. Recalling the horror stories from Perspectives class of missionaries who go to third world countries and literally build themselves fortresses to live in and wonder why the local people never trust them, we laughed and said we’d never be like that. But separation happens in subtler ways in the field as well. My weakness is definitely language. If I can get away with speaking English in almost any situation, I will. The other day I asked the cashier at Costco in Japanese if I could speak English. She replied (also in Japanese) either Japanese or English was fine. So of course, I defaulted to English. Seems innocent enough, but that decision draws a line between myself and a local person that doesn’t need to be drawn. I’ve made a decision to be more intentional about language acquisition this year. It is one barrier between myself and the Japanese people that I don’t want to let languish any longer. But many things can become the “fortresses” we live in. Where we chose to live, where we chose to worship, who we chose to become close friends with. And in order to live in the world we have chosen to live in, we may have to make some uncomfortable choices that draw us closer to the people we have come to share the gospel with. Boundaries are difficult to identify, but must be set. The more ministry becomes a part of everyday life, the harder it is to identify the boundaries that separate ministry from our personal lives. But wait, that sounds like a contradiction, doesn’t it? Shouldn’t ministry fully integrate into our personal lives? The answer to that could probably be debated at length, but one thing is certain; nobody is able to do ministry 24/7. There must be Sabbath days, times of refreshing for our souls, times to spend only by ourselves or with our family. Jesus set many examples for us to follow with regards to time alone with God, time fellowshipping with his closest friends, and time being among the needy crowds. He took naps at times which his disciples may have considered inconvenient for him to do so! But Jesus knew how to work, how to play and how to rest. In a workaholic society like Japan, setting work boundaries is actually a ministry in itself. If we don’t set aside time to refresh ourselves, we are no different from secular Japan that tells people they must work themselves to the point of exhaustion to be productive and therefore, worthy. If our lives in Japan are to be a witness to those watching us, then we need to demonstrate the value of the Sabbath, of time for ourselves and our family. It’s unfortunate that many churches fail because their pastor, in their zealousness for God’s work, forget to set boundaries and forgo rest and refreshment time. I want to do it all. But there are times when I need to be reminded that I’m not here to do it all. That God has a specific calling for me at this time and I need to stay true to that calling and not wander off following the latest, shiny thing I see. The way I do this is to always know our vision, our church’s vision, and ensure every activity I do is in alignment with those visions. English Summer Camp is one of those programs where it is crystal clear that it aligns with the visions we share with our church pastors on reaching the young families in our community. And so I weigh each of the ministries we are involved in against our personal ministry vision and our church ministry vision and it becomes much easier to know how to prioritize my time and energy. We are in the world, not of the world. We are truly blessed in having so many people and churches partnering with us in ministry that finances are rarely a concern for us. I don’t say this to boast, because I know God has provided those partnerships for us and given people a heart to reach the people of Japan through our ministry, and that is humbling. It is also a responsibility that I don’t take lightly and thinking about how we spend based on how God has provided is at times stressful. The worldly man in me sometimes desires to be free of that responsibility. “If we were independently wealthy, we could focus on the things we want to do and not have to worry about financial accountability,” I think. And then I start wondering how I can make that happen. Now I don’t believe being wealthy is a sin, but when it becomes a distraction from our ministry, then it becomes sin. And when I start to see the blessings of God as a burden because I am too proud to accept His financial blessings on us through others, that is certainly sin. Where this really hits home is with photography. As I gain in experience and exposure, many well-intentioned people have talked to me about ideas for making my photography more profitable. And I must admit the idea of becoming financially self-sustaining through photography is a seductive idea. But at this season in our lives, it just isn’t in alignment with our vision. The way I try to bring these impulses under control is to offer my photography services to ministries and ministry workers at pro bono or highly discounted rates. Of course, photography is an expensive business to be in because of the cost of equipment, and the wear-and-tear and technological advances that require equipment to be replaced. But though I have been able to offer free or nearly free services to local ministries, God has still provided financially an amount of money that can be used to cover the cost of repairs or replacement for much of my equipment. This is funded through gifts and donations from ministries or payment for small photography jobs unrelated to ministry. Believe me, it’s difficult to explain to people that I can offer free or highly discounted photography services to them because of the obedience and generosity of individuals and churches back in America supporting us. But it’s a story I love to tell because it is a concrete image of God’s faithfulness at work and the love of Christ through his body, the church, in action. No one is an island. One of the most disappointing things I see among fellow ministry workers and organizations is the cowboy mentality that often comes with being raised in the West (western culture, not western US). I believe walls between churches and organizations were crumbled as a result of the cooperation needed to respond to the 2011 Tohoku disaster, but remnants of the walls still remain. As we live here, we see them, though again, more subtly than one might imagine. But I do realize that many missionaries and organizations want to work alone or within their own context. Working with other individuals, churches, denominations is messy. Feelings get hurt, people get offended, too many opinions on how to do things get thrown around. I’ve been on both sides of that as well, feeling like an outsider being kept out and feeling like an insider needing to exclude others from my work. The fact is, the work to be done in Japan, in Tokyo even, is too great for one family, one church or even one organization to tackle alone. Our English Summer Camp will likely require 100 or more volunteer helpers, many of which will need to be proficient in Japanese and English. Our church alone won’t have the resources to staff it. We will need members of other churches or organizations to help us. And what will they gain? Perhaps nothing apparently significant. No new church members. Maybe a line item on their annual report. But the Kingdom of God gains. The reputation of the church in Japan gains, as not-yet-believers see that we can work together as well as we can work separately. New believers are added to the global church who will eventually gather in Heaven, worshiping God together. The enemy seeks to divide the church. He has done it successfully since the church was founded and he knows it is one of our most glaring weaknesses. For while we argue and offend others with differences in opinion that are insignificant to the gospel message, we are distracted from doing the real work of the Lord together. Ministry workers, we need thicker skins. We need to not take offense when someone disagrees with something that in the big picture is minor. Political views. How we raise our children. Even minor doctrinal differences that have no bearing on the message of the gospel. And we need to stop feeding the machine that turns us against each other. Stay positive. Focus on the only message that matters: the gospel of Jesus Christ. Because in the end, we need each other. We need to help one another. We need to deal with one another, warts and all, because that’s what Christ called us to do. That’s life: dirty, messy life. Let’s not forget when we answered the call to join the front line of the battle for people’s souls, we would be living in the trenches. With over 60 years of experience and tens of thousands of children in participation during that time, Redwood Chapel Community Church knows a few things about Vacation Bible School (VBS). It was only natural, with their focus on ministry in Japan for the next decade or two and our local church with a vision to reach the thousands of young families in our community, that God would bring us together in partnership. What we weren’t prepared for was the depth and breadth of God’s work was going on behind the scenes, long before we even came together as a team. Redwood Chapel sent a small vision team to meet with the leaders of our church about planning an English Summer Camp (or ESC, the contextualized name of VBS here in Japan) for the summer of 2016. In our minds, 100 kids was a stretch for a first year program in Japan and one which would comfortably fit in our above average sized church. I should explain the significance of his offer before we go any further. 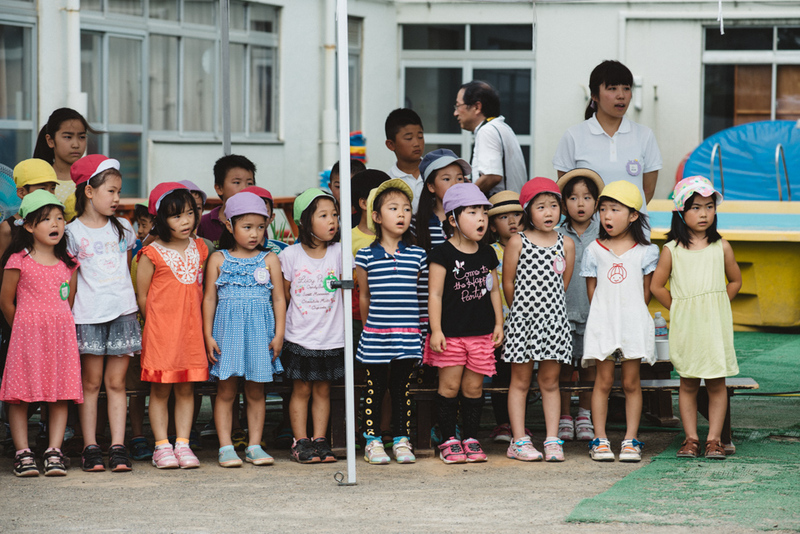 First, Rikko is a large preschool which is currently in expansion from 450 children to 700 children. We would be the first outside group to use the new facilities and obviously if the ESC program were to grow in size over the years, it would take a while for us to reach capacity. Second, though Rikko was founded by Christians over 100 years ago and maintains a religious organization status, the school has been mainly secular in nature. However, the current head of the school has invited our pastor to restart “religious activities” at Rikko, which is basically an invitation to plant a new church service. The ESC program would be a huge jump-start to that service. A few of the Rikko children attending the groundbreaking ceremony for the new buildings earlier this summer. As we spent time together as a team, the threads of God’s handiwork started to become clear. One of the leaders from Redwood Chapel was strongly influenced to become a Christian when our pastor’s father preached at a conference in California decades earlier. Another Redwood Chapel member likely visited the original site of our church on a short term mission trip to Japan in the 1980’s (and possibly met our pastor as a college student). And the whole idea that what we originally envisioned as a typical English outreach for children was becoming the catalyst for a brand new church plant. 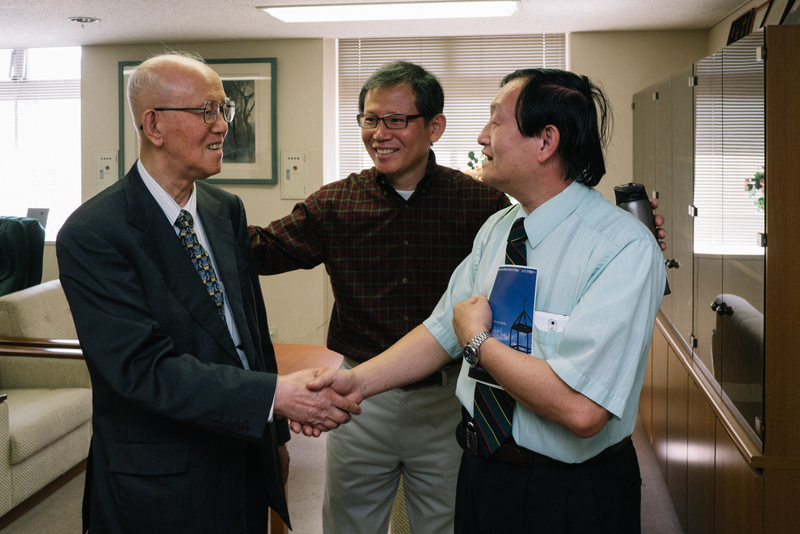 John Chou reunites with Pastor Reiji Oyama, the man who had a great influence over John’s decision to become a Christian many years earlier. In a nutshell, God transformed our plans, stretched out our vision and made something much greater. Currently, we are planning for 300 children in two tracks: preschool and elementary. The majority of our volunteers will come from the mothers of the children, nearly all not-yet-Christian. Taking our plans from 100 to 300 children in the first year will be a stretch in many ways, but we believe God will be with us each step of the way. 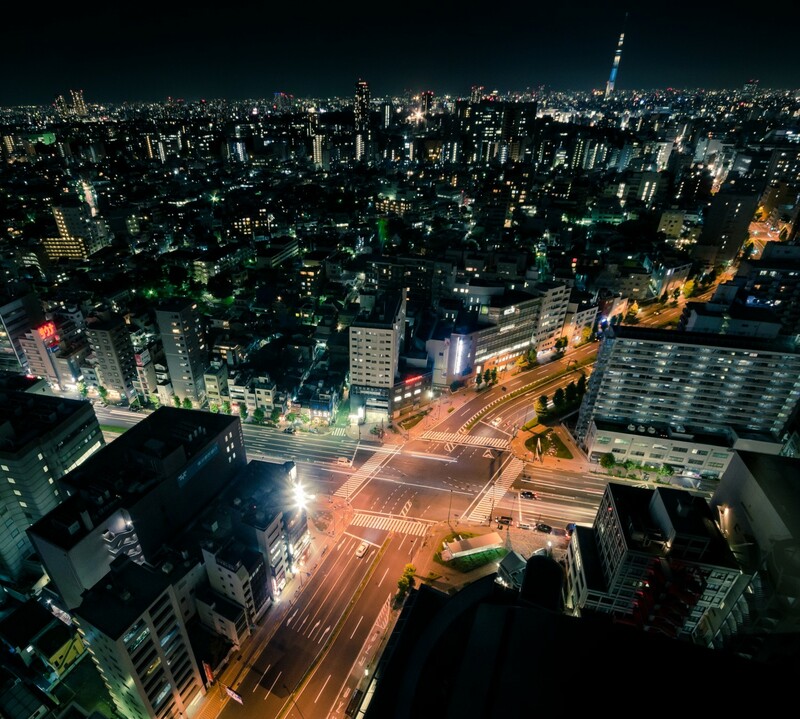 You can partner with us as well, in your prayers over the next 10 months as we make this vision a reality for God’s glory here in Tokyo.